The Kid loooooooves pasta. That’s an extreme understatement. I think all kids like pasta and that’s why it’s on so many kid’s menus at restaurants. I’ve got a trick that I use to make pasta noodles a bit faster than waiting for the water to boil, putting in the noodles, waiting waiting, and draining. This recipe actually uses a similar concept. 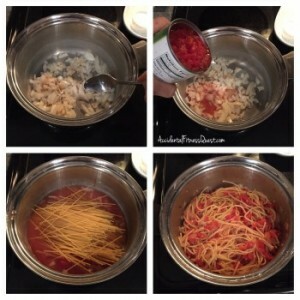 You use the water from the broth and tomatoes to cook the pasta noodles. No boiling the pasta separately. No extra pot to wash or draining. Easy as can be. One pot and that’s all you need. OK, and a spoon or something to stir with. 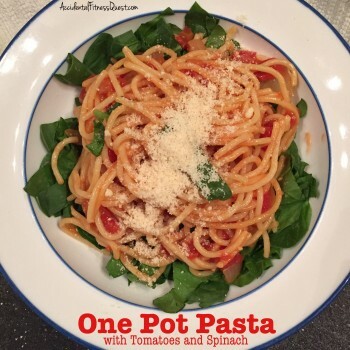 One pot and a spoon pasta doesn’t sound nearly as cool. Spray a large pot with non-stick spray and heat over medium heat. Add the onions and garlic and saute for about 3 minutes until the onion softens. Add the can of undrained tomatoes, broth, and oregano. Stir in the dry noodles and submerge them in the liquid. Bring to a slow boil, and reduce heat to medium low. Cover and simmer for 7-10 minutes until the liquid is absorbed and the noodles are cooked. Check every now and then to make sure they don’t boil dry by accident. Remove from heat and stir in the spinach. Let stand for about 5 minutes until the spinach is wilted. Divide into bowls and top with the parmesan cheese. Makes 4 servings at approximately 262 calories each – 11g protein, 50g carbs, and 2g fat. You can get creative and use flavored diced tomatoes if you like. They’ve got quite a few out there. I just stuck with the basic flavor since The Kid isn’t partial to surprises like that. She’s picky about her pasta. The leftovers were easy to pack for lunch the next day and you can even double the recipe if you’ve got a bigger family. Doesn’t get much easier than this even if you need a pot AND a spoon!